Several decades ago, I lived in Manhattan. I was a small-town girl, drawn to work in publishing. Like a lot of people who move to large cities, I loved the wealth of live performances available. I used to walk to work by Lincoln Center and see signs for upcoming performances: the New York City Ballet and American Ballet Theater, among others. At the same time, though, I was very aware that these performances were highly priced and often sold out. I couldn’t not be aware, since the posters were often plastered with red diagonal “sold out” signs. I think those red diagonals exerted a symbolic effect of a kind, on me at least. They indicated high desirability — but they also came to signify unattainability. At the time, I made around $15,000, and even discount tickets were a financial challenge. But, time went by. I got new jobs, paying a lot more than those walking-by-Lincoln-Center-in-my-tennis-shoes days. Still, I associated performing arts with tickets that were way too expensive. Sure, I knew there were cheaper seats way up high. But, frankly, they intimidated me. Every once in a while, I’d see something in the cheap seats (memorably, visiting Seattle’s Benaroya Hall, Beethoven’s Ninth Symphony). But we were perched on folding chairs in a box as high as it was humanly possible to go and not be on a tightrope next to the ceiling. I distinctly felt as if I’d been placed on a folding chair over the Grand Canyon. It was scary, and that detracted from the fun quotient considerably. Part of price and the quality of sold-out-ness, of course, is whether you see the arts as for you. Think of movies. As an art form, they’re endlessly attainable. They’re inexpensive and abundantly available to anyone who can walk or sit on a couch. Performing arts, especially in expensive cities, seem less so. The sense that the art is not for you may not be the what the companies or performers intend to convey, but it’s there just the same. I moved to a New Jersey suburb still within reasonable distance of a city. I had a job that paid more. I went back to graduate school. It may sound counterintuitive, but dance and performing seemed more attainable once I moved away from a city that has a lot of dance. First, I found inexpensive dance venues. In New York, the Joyce Theater is an exciting and innovative small theater where tickets can be bought for $10.00. I saw great dance there, of all types from ballet to modern to tap. Twyla Tharp. Savion Glover. The Houston Ballet. Complexions Contemporary Ballet. Sean Curran Company. And way more. I felt I’d stumbled upon my very own dance renaissance. I can’t say enough about the wonderful performances I’ve seen: not only the beauty of dance, but choreography that’s thoughtful and impressive in its implicit commentary on identity, community, and culture. The constant stream of wonderful dance really opened me up to seeing the best of the old masters (Martha Graham, the Firebird, George Balanchine) and the best of the new (Mark Morris, Alexei Ratmansky, Christopher Wheeldon). Small experimental theaters like the Joyce exist in many towns. There’s Philadelphia’s Ballet X, for example, and many more. And almost every university of size, if they have a performing arts stage, will book at least some dance companies. But why didn’t I know about the Joyce and similar venues while I was in the Lincoln Center-yearning stage? As I made more money and had more disposable income, I began to assume that things were out there for me, rather than not. Manhattan put me into a state of constant not-having-but-yearning-to-have. The more I had once I got out of the city, the more I saw the world as a place that would (eventually) yield what I wanted. As I started to explore the dance world, I got more and more of a sense that dance wanted the world to come see it, me included. Early one September, once the Joyce had convinced me how cool dance was, I went online to check out tickets for the Alvin Ailey Dance Theater. I thoroughly expected Alvin Ailey tickets to be on the expensive side. After all, they were famous! And on television! I was gearing up to see all the big companies I hadn’t seen — a one-woman dance history tour, and Alvin Ailey was on my list. But some of the tickets — and not in the tight-rope walker section — were just $25. In the orchestra section. On the side, to be sure, but still! I was so in the mindset of uptown tickets being expensive that I thought it must be a misprint for $125. So I called. 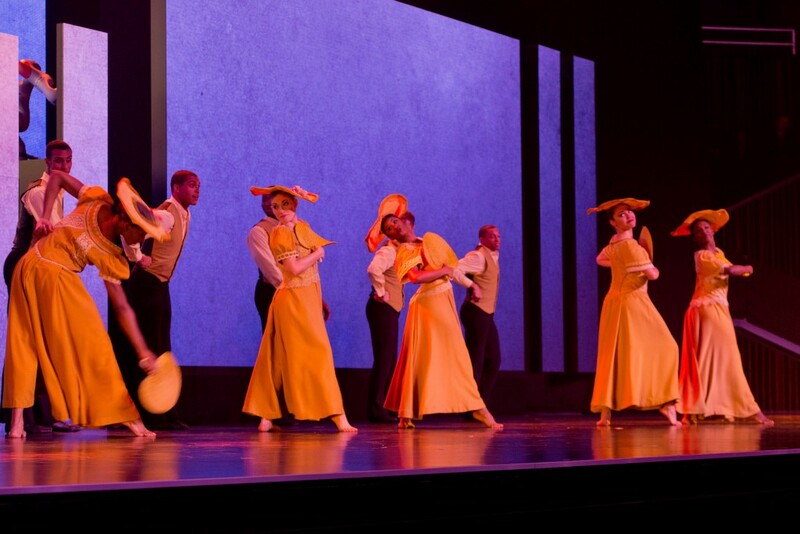 A box office person told me that the Alvin Ailey Dance Company always had some tickets for $25.00 because “Mr. Ailey wanted it that way.” In his will? Part of the charter of the company? A precept carried on by the current directors? Outreach to the community? I haven’t been able to find out for sure. But it’s interesting to note that the current director says the idea that dance comes from the people and should be given back to the people is part of the company’s spirit. But I do know that the phone call was the final trigger of a big change in thinking. One, cheap tickets could be had. Two, dance is accessible with a plan. Three, a lot of stuff that seems inaccessible is accessible if you use creativity, a plan, and a calendar. Alvin Ailey is not the only performing arts troupe to quietly have fairly inexpensive tickets, usually on the sides. They go quickly, so anyone wanting to avail themselves of this method needs to get their tickets early in the season. Creativity, a plan, and a calendar.